[26-Feb-16] The ocean marine ecosystems will alter as a consequence of climate change, with ecological and biogeochemical ramifications. Here we use an earth system model which includes marine biogeochemistry and ecosystem, as well as important optical constituents such as coloured dissolved organic matter (CDOM), non-algal particles (NAP) as well as an optically diverse set of phytoplankton types. Importantly, the light field is spectrally resolved and the model outputs surface reflectance similar to that measured by ocean colour satellites. We study the trends over the 21st century in ecologically and biogeochemically important metrics such as primary production and plankton community structure, and in particular how these can be captured by reflectance and other optical characteristics. We find that blue/green reflectance ratios are correlated with the regional and temporal changes in productivity in many, but not all parts of the ocean. On the other hand we do not find a strong signature of community structure change in the blue/green reflectance and explore how other optical signatures produce a clearer signature. There are some regions which show clear signals of climate change induced alterations to optical characteristics, but others where the signal-to-noise ratio is too high. 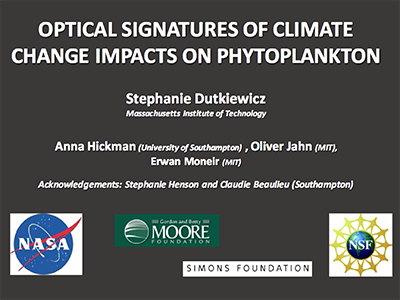 The model provides a laboratory to explore the feasibility of capturing the satellite-like derived optical signatures of global change impacts on phytoplankton. Animated GIF #1 | Animated GIF #2 Credit: Dutkiewicz, S., Hickman, A.E., Jahn, O., and Moneir, E..